AIADMK's TTV Dinakaran was arrested April 25 after 4 days of questioning by the Delhi police. New Delhi: The Enforcement Directorate has registered a money laundering case against AIADMK (Amma) leader TTV Dinakaran and others in connection with the Election Commission bribery case. Officials said the central probe agency has registered a criminal case under the Prevention of Money Laundering Act (PMLA) after taking cognisance of a Delhi Police FIR in the matter. 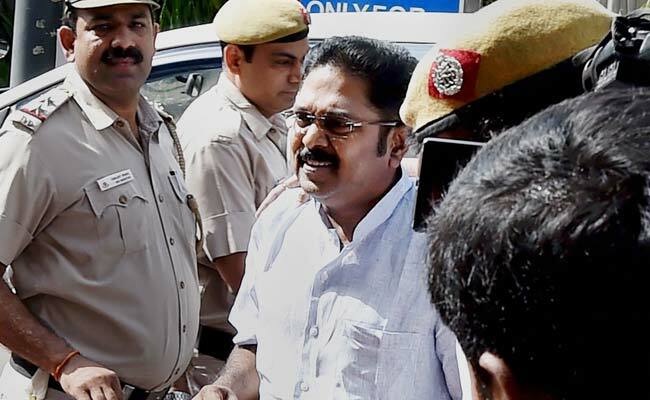 Mr Dinakaran and his aide Mallikarjuna were sent to the Tihar Jail till May 15 by a Delhi court yesterday after the police said that the accused were not needed for custodial interrogation. Mr Dinakaran was arrested on April 25 after four days of questioning by the Delhi police for allegedly attempting to bribe an unidentified EC official to get the AIADMK's 'two leaves' election symbol for his faction for a by-election to the RK Nagar Assembly seat in Tamil Nadu which was later cancelled by the Election Commission. The EC had frozen AIADMK's 'two leaves' symbol after two factions led by Sasikala and former chief minister O Panneerselvam staked claim to it. Alleged middleman Sukesh Chandrasekar, who was the first to be arrested in the case, had struck a deal for Rs 50 crore to help the faction keep the 'two leaves' symbol. The AIADMK (Amma) faction leader has been accused of allegedly arranging the amount from undisclosed sources and getting it transferred from Chennai to Delhi through illegal channels. Mallikarjuna, who had been accompanying Mr Dinakaran everywhere ever since the arrest of alleged middleman Sukesh Chandrasekar on April 16, was arrested for facilitating the alleged Rs 50-crore deal between Mr Dinakaran and Chandrasekar.